William C. Gibson photographed by Kevin Doyle. Dr. William Gibson got things done. An effective advocate in public, he was an irresistibly convincing arm twister behind closed doors. He was adept at raising money, whether from a penny-pinching government, or well-heeled private donors. Many of the amenities taken for granted by residents of Vancouver owe their creation, at least in part, to Dr. Gibson’s quiet campaigning. He spearheaded a drive to get a hospital built at the University of British Columbia; organized funding for a paved path for cyclists and pedestrians along the Stanley Park seawall; ensured the financing was in place for the purchase of lands now home to the VanDusen Botanical Garden. Perhaps the achievement of which he was most proud was the founding of the Woodward Biomedical Library at the university. The library gained spectacular donations through Dr. Gibson’s connections, including a rare, three-volume set of Leonardo da Vinci’s biological drawings published in Norway during the Great War. The doctor’s own sleuthing led to the acquisition of one of only 50 copies of a first edition of William Harvey’s 1628 treatise on blood circulation. The copy of “Exercitatio Anatomica de Motu Cordis et Sanguinis in Animalibus” (“On the Motion of the Heart and Blood in Animals”) had been tracked down to a bookdealer who kept the pristine, 72-page volume in a bank vault at Belfast. A man of dignity, Dr. Gibson insisted he never needed to indulge in the vulgarity of asking wealthy friends for money. A compelling talker, he also convinced voters in Vancouver to elect him to park board and city council, though a campaign for mayor ended in defeat. Dr. Gibson also was a prolific writer, producing 10 books of general interest, uncounted articles and memoirs, as well as 150 scientific papers on neurology and the history of medicine. Born in Ottawa, his parents, the former Belle Crawford Magee and John Wesley Gibson, left the nation’s capital before the boy’s second birthday. His father took a position as head of the Normal School in Victoria, later moving to the education ministry, where he was responsible for initiating a correspondence program so farm children could attain a high-school diploma. He was so successful at this that the federal government asked him to launch a similar project for servicemen during the Second World War. Belle Gibson wrote a biography of her husband, “Teacher-Builder: The Life and Work of J.W. Gibson,” which was published in Victoria in 1961. Bill Gibson graduated from Victoria High School before attending Victoria College, located at Craigdarroch Castle near the city’s downtown. He crossed Georgia Strait to complete a bachelor’s degree, graduating with UBC’s first commerce class in 1933. He spent that dry Depression summer labouring on a farm near Moscow, Idaho, where his duties included pumping by hand water for pigs, cattle, sheep, and horses. The farm’s owner, a medical doctor, left for him Harvey Cushing’s two-volume biography of Sir William Osler. That fall, inspired by the book, he began medical studies in Montreal at McGill University, Osler’s alma mater. He was offered in 1934 a year-long research fellowship at Prof. Wilder Penfield’s fledgling Montreal Neurological Institute, which opened in September. He went to Oxford the following year as a histology demonstrator, appointed by Sir Charles Sherrington, the Nobel Prize winner in medicine who, at 77, was retiring from the physiology department. Sir Charles had been boon companions with Frank Wesbrook when the pair studied at Cambridge in the 1890s, Mr. Wesbrook later becoming the first president of UBC. Dr. Gibson wrote a biography of Mr. Wesbrook in 1973. Sir Charles mentored his brilliant young pupil. Dr. Gibson embarked on a medical tour of Europe, seeing first-hand preparations in Nazi Germany for the coming war. He befriended the recently fired director of the anatomical institute of the University of Bonn, who lost his position because his wife was Jewish. Dr. Gibson saw the horror of Nazi censorship while doing research, as books written by Jewish authors had been removed. Dr. Gibson investigated neurological cases at the Sorbonne in Paris and surveyed the clinical treatment of nervous diseases in the Soviet Union at Leningrad. In 1936, he was assisting at a hospital surgery in Madrid when relatives snatched the patient, who suffered from a brain tumour, from the operating table. He was at Santander in Basque country when a military uprising sought to overturn the elected democratic government, the opening shots in what would become the bloody Spanish Civil War. Dr. Gibson escaped aboard USS Oklahoma, a battleship sunk five years later during the attack on Pear Harbor. It was during this tumultuous time that Dr. Gibson attended a speech by the British fascist leader Oswald Mosley at the Carfax Assembly Rooms at Oxford. The hall darkened, a single spotlight lighting the would-be English fuhrer, who gave the raised-arm fascist salute. “Yes, Oswald, you may leave the room,” one wag shouted, and the room became a battleground between jeering students and Blackshirt goons. The chaotic era did not distract him from completing a masters of science from McGill (1936), a doctorate from Oxford (1938), and, lastly, a medical degree from McGill (1941). He took a year of recuperation in Victoria and Mexico after being diagnosed with rheumatic heart disease. He served during the war in the clinical investigations unit of the Royal Canadian Air Force, engaging in night-vision experiments, as well as conducting tests on methods of removing nitrogen from the joints of high-altitude flyers. Dr. Gibson became deputy director of medical research at RCAF headquarters. After the war, he was senior medical officer for 19 Wing (Auxiliary), rising in rank to wing commander. He returned to the Montreal Neurological Institute as a resident in 1945, though he soon returned to globetrotting with stints as a visiting neurology professor in charge of the epilepsy clinic at the University of California, San Francisco, and a two-year term as research director for the mental hospitals of New South Wales, Australia. He resigned from the Australian post in disgust at the gross neglect of patients. His revelations about conditions led to calls for a Royal Commission. A return to British Columbia led to the establishment by Dr. Gibson of a neurological research laboratory on the Vancouver campus. The quarters were small and the space soon filled with glass jars of brains provided by the province’s mental asylums. The campus medical school accepted its first class of students in 1950, though conditions were basic. War surplus huts provided classroom space, while cadavers were stored in a room in the agricultural department’s dairy barn. Dr. Gibson procured 60 tissue samples from a histology lab at Oxford, the teaching samples arriving via the Panama Canal mere days before the start of class. Dr. Gibson founded UBC’s department of the history of medicine on his way to building a reputation as one of Canada’s most distinguished academic physicians. As a neurology professor, he initiated studies into the biochemistry of schizophrenia and acrodynia (pink disease), also establishing a laboratory to monitor the brain waves of patients. He had an uncanny talent for matchmaking a patron to a project. A friendship with P.A. (Puggy) Woodward, son of the founder of a chain of department stores, who had an interest in honouring his father as well as the province’s pioneer doctors, led to the creation of the Woodward Biomedical Library. Dr. Gibson’s connection with Cecil Green, a founder of Texas Instruments and a former student at the university, led to the purchase in 1967 of a mansion adjacent to the campus. Designed by the noted architect Samuel Maclure in 1912, Kanakla, meaning “house on the cliff,” was donated to the alumni association, which renamed it Cecil Green Park. In 1968, Dr. Gibson helped found The Electors Action Movement, a moderate and reformist municipal party in Vancouver. He ran as mayor under the party’s banner two years later, facing incumbent Tom Campbell, a hippie-baiting millionaire apartment developer. The TEAM campaign promised “better people for better government,” but in an election that turned into a referendum on the incumbent the mayor was returned with a reduced plurality. Mr. Campbell took 54,253 votes to Dr. Gibson’s 41,667. Anthony Gargrave, an English-born lawyer and former MLA, got 16,287 votes in the NDP’s first campaign for the mayoralty. A fourth candidate, a 20-year-old with the same last name as the mayor, though unrelated, took 4,922 votes. The man was charged the day after the election with trafficking in LSD. In 1972, Dr. Gibson won election to city council as TEAM captured nine of 11 council seats, including Art Phillips in the mayor’s chair. The doctor’s mannerly approach, conciliatory by nature, did not seem suited to the bare-knuckle tactics more often associated with British Columbia politics. He served two terms as an alderman. A publishing career was nicely bookended by two volumes — “Young Endeavour,” in 1958, a look at precocious contributions to science by medical students, and “Old Endeavour,” in 2007, snapshot biographies of physicians whose accomplishments occurred beyond age 65. The author himself was 93 on the book’s publication. He also wrote biographies of Sherrington and the Spanish neuroscientist Santiago Ramon y Cajal. 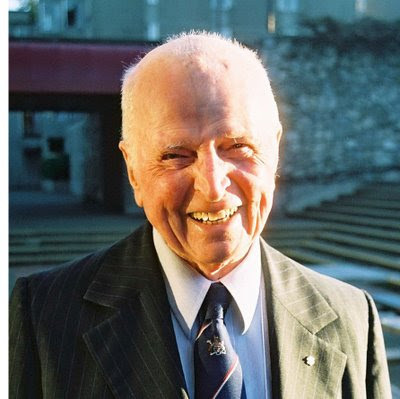 Dr. Gibson was appointed a member of the Order of Canada in 2002, matching an honour bestowed a decade earlier on his brother, James Alexander Gibson, a scholar whose own long contributions included service as private secretary to prime minister Mackenzie King, with whom he attended the founding of the United Nations in San Francisco in 1945. A project promoted by Dr. Gibson in his later years was a campaign to build a concert hall on Victoria’s Inner Harbour. Last September, his friend Kevin Doyle persuaded the architect Arthur Erickson (obituary, May 20) to come to Victoria for a day to discuss plans. In 1989, Dr. Gibson married Clotilde Southgate, known as Coco, who spent her early childhood on her family’s vast Mexican ranch, a hacienda which at one time issued its own currency and maintained a 100-man militia as a defence against bandits. She earned master’s degrees in education and Mexican-American studies. Dr. Gibson, whose hobbies included collecting plants, imported from the Aegean island of Cos seeds from the sycamore under which Hippocrates is said to have taught. Six-story-tall sycamores now grow in Victoria and Vancouver from these seeds. In 2005, every freshman medical student at the opening of the University of Victoria’s medical school — yes, he played a role in getting it built — was presented with a seedling. William Carleton Gibson was born on Sept. 4, 1913, at Ottawa. He died on July 5 at his home in Victoria. He was 95. He leaves a daughter, Kate; sons David and Ian; two granddaughters; and, a great grandson. He was predeceased by three wives — the former Barbara Baird, a nurse whom he married in 1946; Ruth Bourne, whom he married in 1984; and, Clotilde Southgate, whom he married in 1989 and who died in 2001. He was also predeceased by two sisters and a brother.